To build the Twitter service you need the "Node-RED Starter" boilerplate from the Bluemix catalog as well as the "SQL Database" service. Create the Node-RED boilerplate first, then add the database service and directly bind it to the new application. Once everything has been provisioned, it is time for wiring up the Twitter service in the flow editor. The following picture gives an overview of the two flows when completed. I made the flows available in the Node-RED library. The lower flow consists of a Twitter input node to receive incoming tweets for a user. The tweet is then analyzed for known hashtag commands (Process Twitter Input). 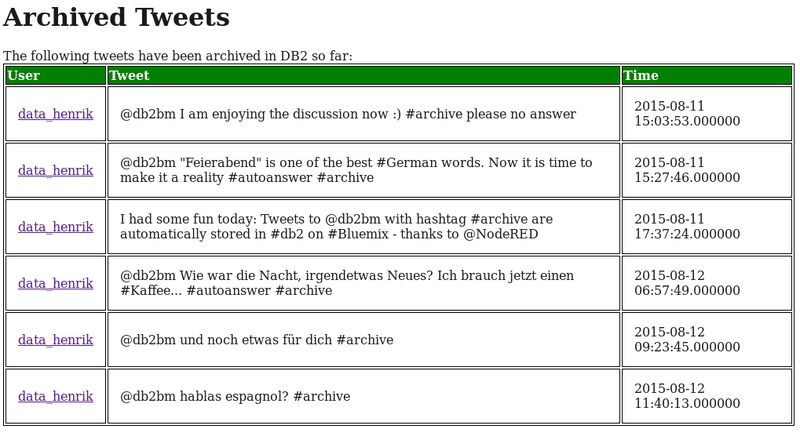 If "#archive" has been specified, some data is handed over to the SQLDB output node (green, "tweet store"). In all cases a response is prepared and then a reply tweeted, in some cases also a delayed follow-up response. The upper flow is used for Web-based reporting on stored tweets. An incoming http request is routed to a SQLDB query node. There the tweet data is fetched from DB2, handed over to a template to produce an HTML page with the result table which finally is returned as http response. It is important to use the same column names as in DB2, including upper casing. Else there won't be a match. In the input and output nodes for sqldb/dashDB access the same rule applies to specifying table names (remember: if no quotes are used for table names, names are converted to upper case). I used a template node to format query results into a HTML table. The template and the resulting output are shown below. This concludes the overview. Let me know if you are interested in details. And if you want to test the service, tweet to "@db2bm". 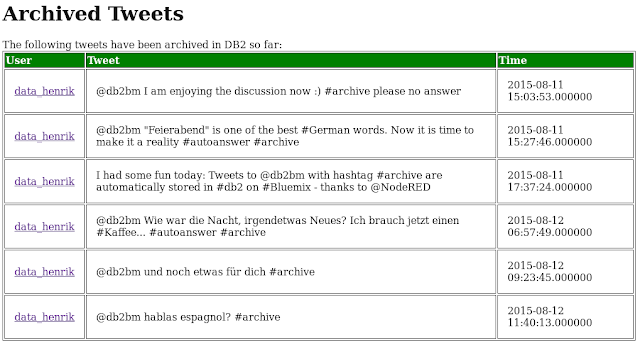 The hashtag "#archive" in the tweet (when found :) causes the message to be store, "#autoanswer" produces a more elaborate random reply.